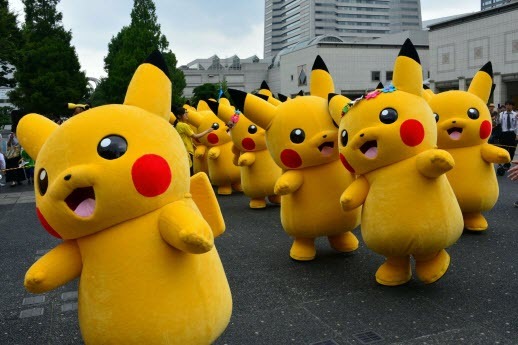 Last week, Nintendo and The Pokémon Company launched Pokémon Go, a game for iPhones and Android smartphones featuring the classic video game franchise where players catch and train special creatures called Pokémon. What makes the game special is its use of augmented reality, where Pokémon will appear as if they’ve been spotted in the real world. This article by Forbes highlights the health benefits behind being a part of the Poke-phenomena. Use your lunch breaks to get outside and walk; find what different Pokémon you can catch today. Finding the same ones every day? No problem. I have recently collected about 15 Zubats, but in my frustration, I learned about transfer options and the rewards that come with it. While some office locations lend themselves to be active after work more than others, finding a Poke Gym near you is always a good excuse to pack those tennis shoes in the morning. The weather is warm and the possibilities are endless, invest your free time exploring new parts of your city. Pokémon Go does recommend being aware of your surrounding and staying safe, above all. Maybe you are the social media coordinator at your current position, or maybe you know who writes the blogs for your company. Maybe you have nothing to do with gaming at all and work for a nonprofit that promotes business ethics. Find a creative way to incorporate this new hobby into your routine. Keeping your brand’s content relevant is a key strategy to developing shareable content. Hopefully, you’ll be able to show your boss some ROI by being creative! How can you position your mission statement using this hot topic? Whether Pokémon Go is here to stay or not, it is clear that it has swept our country with wildfire traits. Fun fact: while the game was launched globally, servers could not keep up with the high demand of users and has temporarily confined its programming to the US and Australia until they can solve server issues. All child fantasies come true aside, it is inspiring to see what this game is doing for a demographic that would otherwise not be engaging in physical activity. Subject matter experts at Vanderbilt University commented on the fact that it will be fascinating to see what the health numbers read like in a couple of years if this augmented reality gaming feature prevails. Happy catching, Poké Fans! May your will power be strong and your catching be fruitful.